Membership in Round Square affords our graduating students the opportunity to act as teaching assistants at some of our sister schools, if they decide to opt for a gap year between high school and university. 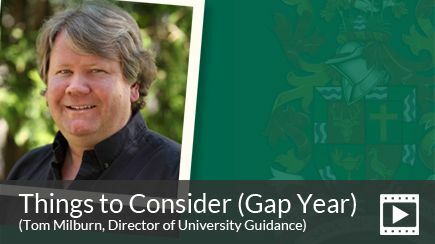 For more information about gap year opportunities, please contact the Director of University Guidance, Tom Milburn. The British Alumni of Lakefield College School have a deep affection for the school and feel a certain sense of privilege for having spent important formative years attending the school. Those who found themselves part of the generous and warm-hearted Grove community during the years of World War Two (WWII) felt a special element of gratitude. From those motives sprang the idea amongst the British friends to provide an annual travelling scholarship. The objective was to encourage graduating students to travel – initially to the UK, but increasingly to destinations further afield. No limitation was imposed other than a requirement to write an account of how the bursary had been employed. So in 1980 the British Alumni Travelling Scholarship (BATS) was established. To this day, the Scholarship continues to support one or two students every year in their travels and adventures abroad. Accounts of their experiences, now numbering four volumes, can be found in the school library, guidance office and the archives. We are most grateful to the Friends of Lakefield College School UK for providing our students this opportunity and for what is perhaps the most prestigious scholarship of all. Zoe Edwards '09 was the 2009 BATS recipient. Her year abroad took her around the world, and she says, "I obviously knew that I really wanted to go to university. I think the year off prepared me so well, I'm so glad I did it. I got to see so many things we learned about in school; it felt like I was experiencing them more, which was amazing." Bianca Bell '06 was the 2006 BATS recipient. Reflecting on her work and travel in Europe, she says, "As I am figuring out my role as a citizen of this world, I have come to realize that being travelled is an invaluable asset."